Objective: Students will reflect on and write about select course readings. They will create and share a lesson that uses multiple representations to build colleagues’ understanding of the reading. Sanger, L. (2010). The un-focusing, de-liberating effects of joining the hive mind. Edge.org. Retrieved June 30, 2013 from http://www.edge.org/response-detail/11489. Team teaching the readings by Larry Sanger and Clay Shirky was a learning experience. My partner, Abby, and I got together multiple times to come up with a way to present the readings in a concise and meaningful manner. Since we had only known each other for a few days, we were lucky to discover our work styles and experiences meshed well together. It did take reading the articles a few times, before we saw a direction in which to head, and could make the most meaningful connections to “How People Learn,” and the implications the articles have on schooling. I do have to say, I enjoyed having a partner- as we were able to build upon ideas and find deeper meaning from the articles. Abby also introduced me to the idea of using a Prezi, as well as the “color, symbol, image” activity. We chose to have our class begin by creating a “Newspaper Headline” to summarize their thoughts in a quick sentence and access their prior knowledge. TodaysMeet was the tech tool used, where everyone was able to combine their ideas into a central location in real-time. We also returned to TodaysMeet, to reexamine initial thoughts, and create new headlines after the presentation was complete. 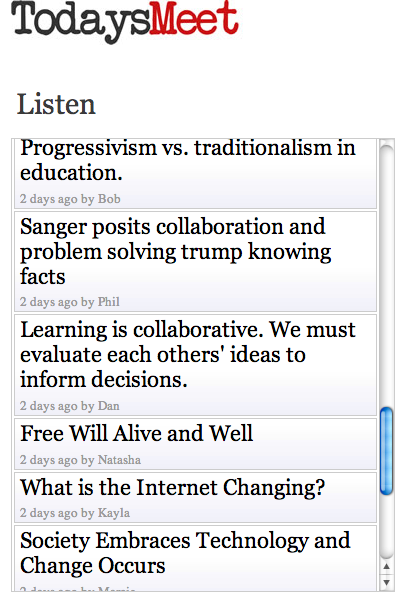 Look below at a screen shot of some of the ideas shared. We then maneuvered within google presentation to take the class through our findings. Click on the image below to access the slides we prepared. Abby and I used Prezi to create our first representation of the articles by Sanger and Shirky. We found that with answering the question to “Is the internet changing the way we think?” that both authors view the question together at the beginning of the dock. They then walk together before heading in different directions. Both directions however, as different as they are- deal with people making decisions. Sanger- believing people have the power to control what they do and think, and Shirky- believing people have the power to create norms for internet use. Prezi offered us a collaborative format, an image/template, and animation to represent the ideas. We turned to our classmates to generate our second representation. Using googledocs and googledraw, individuals reflected on the ideas of Sanger and Shirky to create a color, symbol, and image that represents their message. Below you can click on the example, and scroll through the ideas generated by the class. Color, Symbol, Image/Sanger Explanation: Color, yellow– Sanger has a more optimistic view about how the internet is used. Image, smiley face– people can self-monitor and be satisfied with using the web. Image, lake/sunrise– water is clear and may provide a reflection into usage of the internet. While I am an advocate of googledocs, I had never used the program in this format before, and it proved to have a few constraints. When classmates were uploading pictures and creating drawings, formatting became difficult as images that were larger shifted other participants’ screens down. It was a learning experience, and I would definitely attempt to find a different platform for this type of collaboration in the future. Overall, Team Teaching the Readings, was an experience where I learned to reflect on content (the readings), pedagogy (how to present to the class), and technology (the tools to present).